1. Pre heat oven to 220C/gas 7. Sit the beef fillet on a roasting tray, brush with 1 tbsp olive oil and season with pepper, then roast for 15 mins for medium-rare or 20 mins for medium. When the beef is cooked, remove from the oven to cool, then chill in the fridge for about 20 mins. 2. Heat 2 tbsp of the olive oil and butter in a large pan and fry the mushrooms on a medium heat, with the sprig of thyme, until you have a softened mixture. Season the mushroom mixture, cover with the dry white wine and cook for about 10 mins until all the wine has been absorbed. Remove the mushroom sauce from the pan to cool and discard the thyme. 3. Overlap two pieces of cling film over a large chopping board. Lay 12 slices prosciutto on the cling film, slightly overlapping, in a double row. Spread half the mushroom sauce over the prosciutto, then sit the fillet on it and spread the rest of the sauce on the fillet. Use the cling film’s edges to draw the prosciutto around the fillet, then roll it into a sausage shape, twisting the ends of cling film to tighten it as you go. Chill the fillet while you roll out the pastry. 4. Dust your work surface with a little flour. Roll out a third of the 500g pack of puff pastry to a 18 x 30cm strip and place on a non-stick baking sheet. Roll out the remainder of the 500g pack of puff pastry to about 28 x 36cm. 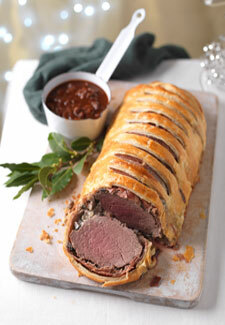 Unravel the fillet from the cling film and sit it in the centre of the smaller strip of pastry. Beat the 2 egg yolks with 1 tsp water and brush the pastry’s edges, and the top and sides of the wrapped fillet. Using a rolling pin, carefully lift and drape the larger piece of pastry over the fillet, pressing well into the sides. Trim the joins to about a 4cm rim. Seal the rim with the edge of a fork or spoon handle. Glaze all over with more egg yolk and, using the back of a knife, mark the beef Wellington with long diagonal lines taking care not to cut into the pastry. Chill for at least 30 mins and up to 24 hrs. 5. Brush the Wellington with a little more egg yolk and cook until golden and crisp – 20-25 mins for medium-rare beef, 30 mins for medium. Allow to stand for 10 mins before serving in thick slices. Please keep me up to date with special offers and news from Woman's own and other brands operated by TI Media Limited via email. You can unsubscribe at any time. The royal family’s favourite foods! Which one of them is a chocoholic? 11 times Kate and William broke the royal rule book! They're doing it their way! Their royal romance - in pictures! 9 things every wine lover will understand! Wine is just for the weekends?! NO WAY! Which type of man is more likely to cheat? Can you spot all 16 tigers in this picture? Can you find the hidden letter in this puzzle? Which James Bond is your ideal man? What does your bedroom colour reveal about you? Which Leonardo DiCaprio character are you meant to be with?